For sounds with simple harmonic structure, the pitch we perceive is usually the fundamental frequency, even if it is not dominant. For example, here's the spectrum of a half-second recording of a saxophone. In one of his most famous columns for Scientific American, Martin Gardner wrote about pink noise and its relation to fractal music. The article was based on a 1978 paper by Voss and Clarke, which presents, among other things, a simple algorithm for generating pink noise, also known as 1/f noise. 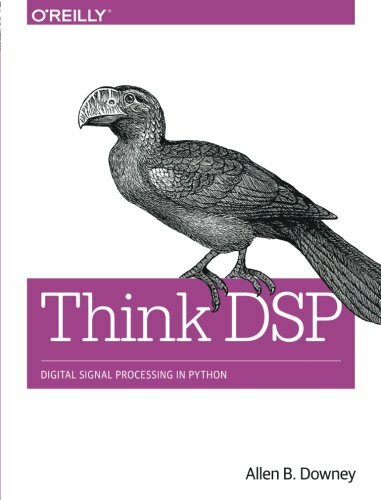 I am working on the 11th and probably final chapter of Think DSP, which follows material my colleague Siddhartan Govindasamy developed for a class at Olin College. He introduces amplitude modulation as a clever way to sneak up on the Nyquist–Shannon sampling theorem. Most of the code for the chapter is done: you can check it out in this IPython notebook. I haven't written the text yet, but I'll outline it here, and paste in the key figures. I am back at work on Think DSP, adding a new chapter on differentiation and integration. In the previous chapter (which you can read here) I present Gaussian smoothing, show how smoothing in the time domain corresponds to a low-pass filter in the frequency domain, and present the Convolution Theorem. Joseph Fourier never met Thomas Bayes—Fourier was born in 1768, seven years after Bayes died. But recently I have been exploring connections between the Bayes filter and the Fourier transform.